Cultural arts and musical performances held by Seribu Islands Tourism and Culture Sub-dept. to commemorate 491st Anniversary of Jakarta in Pramuka Island on Saturday (6/24).
" We can also promote Seribu Islands tourism through this event"
Seribu Islands Tourism ans Culture Sub-dept. Head, Cucu Kurnia said this event is also held to entertain local residents and tourists who spend their holidays in Seribu Islands. "We can also promote Seribu Islands tourism through this event," he mentioned, Sunday (6/24). 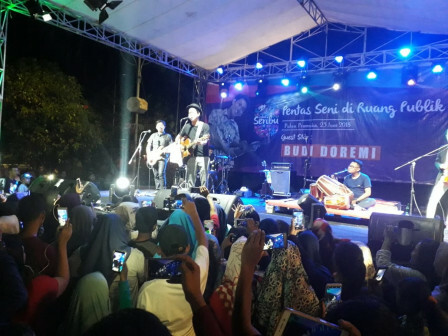 There are performances from hadroh music, Budi Doremi the singer, and local bands from Panggang Island and Pramuka Island. "Beside music performances, we also watch World Cup 2018 together," he conveyed.